Home Fitness What does a Night Run mean to you? This is no time for ease and comfort…It is time to dare and endure.. I live in a very scary city called -Gurgaon, in an equally scary state of Haryana. It’s not safe for a girl to be on the road at any given time of the day. We are better off in chauffeur-driven cars. and this is not an exaggeration. Want to imagine what am talking about? Have you watched the movie – NH 10? Well – that’s pretty much the reality of where I live. So when the Aravalli Trail Blazers announced their midnight marathon in Gurgaon (which happens every year and one that I did back in 2015 too), I knew I had to do this! I had to! I love running in the dark. So tonight – between 9pm and 11pm, I ran 21kms on a well-lit, no traffic route, with hydration points set up every 1 km, a large number of runners, and for many kilometers – I became oblivious to my safety, humidity and let my feet and my thoughts do all the talking…I came back home, ate a lot before midnight (since it’s Karva Chauth tomorrow – Oh yeh, the same archaic festival where women fast for the long life of their husbands, except that now husbands take on the challenge too and we all die of hunger happily ever after :)) and sat down to write this blog! 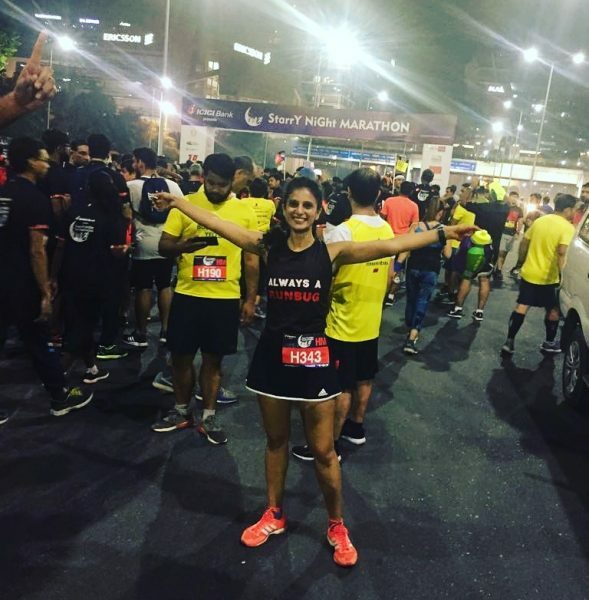 I’ll list down a few wonderful reasons for you to say YES to a night run next time..
As a woman, trapped in a city that lacks basic freedom and even respect for a woman, running in the night with my tribe, made me feel not just free…but daring! You are safe – because good events (like the one I attended today – had security personnel every 300 meters. Yes – I was safe and that made me a happy runner girl. I like running in the dark because I know no one is watching me, or judging me and that brings in a beautiful flow in my feet. My flaws as a runner are taken over by the flow and joy of running..
You see a different persona of your own city. Honestly, Gurgaon is the most culture-less and life-less city I have ever lived in. And I can’t help listing down – that when I walked in my house at 11.25 pm…I had a quiet house to myself. My babies were nicely tucked in bed, the husband was snoring…which basically means I can put up my feet too! It means that I don’t have to stand on my feet for the next 12 hours of the day! Fantastic!!! For now, I will continue to get my share of night running only through high quality well organised events! And I stay ridiculously optimistic that one day ..Gurgaon will be a safe city and pouding the road at night alone or with a few friends wouldn’t be as impossible as it looks today! It’s 2.20 am. My runner’s high from the night run is finally wearing off and I realize that there is life beyond running and even though am done with many miles before I sleep, I must sleep to take on the journey yet again tomorrow! Tomorrow we will try again and make the best of what we have! Happy Running! Happy Night Running!